I have tried logging in through steam via IP, From our website, and from in the ARK Game. I receive server not responding through the steam IP method, and I receive this error message from in the game. http://imgur.com/a/MgGyn a link to the picture showing what's happening to me. Steam Name:shocksrocks SteamID: Shocks574 Stream Link (If Streaming): Hours/Days that you can play: Around 1-5 depending on the day. Thanks. I'm very excited to see this new image...Looks amazing!!! Love it and hate it. Stops us from doing it, but also protects us all now!!! Boys and Girls, stock up on boom booms because we going to need them all!!!! Welcome to the community Sadance. Hopefully we can see you online participating with us a lot. I really enjoy playing with the online community here at ADK. Gaz, I grew up on Mario as well on the Nintendo (nes). I really enjoyed Mario 2 as one of my favorite Mario games. Welcome to the community and I hope to see you around! Welcome to the community Solo! Hope you enjoy the ADK community. We have a DJ in da house!!!! What types of animals do you hunt? I'm a big deer hunter here in Indiana and Michigan areas. FIJI water is amazing as I agree with you. Welcome to ADK forums and community sir. I would love to see some Scotland pictures. I heard its very beautiful in Scotland. You should come to H1Z1!!!!! Welcome to the forums and ADK CommanderSnowflake. 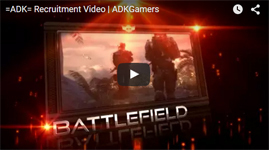 Hope to see you on a lot so you can be apart of the ADK gaming community. Howdy LizardComax, What are your favorite games to play? I hope one of them is H1Z1 :) The community is awesome and they are friendly and respectful towards others and their opinions. Hey Rich, good to see you on here brotha! Hope everything works out with your future bro. Welcome to the forums Pistolpete. I have enjoyed playing with you; even if we have encountered a few cheaters during our last pvp battle.